Today the J-CAT (Joint Cybercrime Action Taskforce) welcomed Poland as its newest member to strengthen the fight against cybercrime. In October 2018, Sweden was also accepted as a part of the Taskforce. Both members have officially deployed their cyber Liaison Officers to Europol to enhance further cooperation against cyber threats. 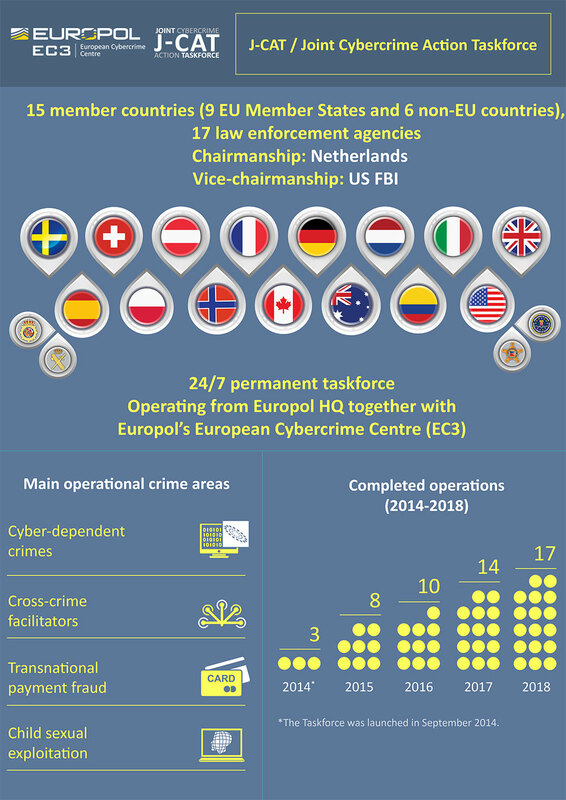 The Taskforce is hosted within Europol’s European Cybercrime Centre (EC3) and comprises cyber liaison officers from 15 EU Member States and non-EU partners and 17 law enforcement agencies. The Taskforce is continuously growing and other countries have also expressed interest in the J-CAT Law Enforcement Attachment Scheme, a new initiative set up by J-CAT and EC3. The Scheme allows non-J-CAT countries with operational agreements with Europol to join the Taskforce temporarily to benefit from the J-CAT and EC3 platforms and if the case is of mutual interest. Handling over 40 high profile cyber cases and holding numerous operational coordination meetings, the main objective of the J-CAT is to continue to enhance collaboration between law enforcement authorities and drive intelligence-led, coordinated actions to tackle major cybercrime threats and facilitate cross-border investigations by its partners. Notable successes include taking down the Luminosity-Link Remote Access Trojan, the webstresser platform and dismantling an organised crime group involved in banking fraud. Cybercrime knows no borders and remains a significant threat, which is why this type of stronger cooperation is necessary. Patrick Corder, Head of the Swedish Cybercrime Centre, said, "To answer the rapidly growing numbers of cybercrimes, Sweden is now joining the J-CAT. We look forward to contributing to the task force and being part of the important work to counter high-tech crime, online sexual exploitation of children and payment fraud. The combined effort of the countries involved, the constant support of EC3 and their allies in the private sector are all key components in a successful answer to the challenges posed by this complex, borderless criminality. Sweden is proud to be part of the J-CAT!" Mr Mariusz Lenczewski, Head of the Cybercrime Bureau of the Polish National Police Headquarters, stated: "Fighting against cybercrime every day becomes more and more difficult. Criminals resign of commonplace forms of offences and are using sophisticated methods more frequently to commit crimes in cyberspace. Only close international cooperation will allow law enforcement agencies to succeed in this difficult fight. We are happy that we could become a member of the J-CAT hosted by EC3 and undertake new challenges alongside specialised experts from around the world." J-CAT-EC3 Roadshows: as part of the J-CAT strategy for 2018-2019, the J-CAT and EC3 have launched a pilot project to raise awareness and increase operational collaboration with regional and local cyber police units from the current J-CAT member countries. This is done through dedicated roadshows. Overall, two roadshows were held in December 2018 for Dutch cyber police and interested cyber prosecutors. In February 2019, a roadshow was held for the Swiss cyber police and cyber prosecutors, and in March 2019 the Norwegian cyber police benefited from the J-CAT roadshow. These events have already led to increased operational contributions to the EC3 and the J-CAT. The next roadshows will be in Germany and the UK. CEPOL webinars on the J-CAT: four webinars on J-CAT are planned for 2019 to raise awareness among law enforcement agencies about the Taskforce and how to cooperate with it. The first one was held in March in English, where close to 300 participants attended. The following three will be in German, French and Spanish over the coming months.